Sri City, January 26, 2017:- The 68th Republic Day was celebrated with enthusiasm and zeal in Sri City. In a colourful ceremony held at the lawns of Business Centre Mr. Satish Kamat, President, Sri City unfurled the National Flag, and took salute in an impressive parade held by the contingents of Sri City Security force. Mr. Shaik Altaf, General Manager, Security & Vigilance coordinated and oversaw the parade. At Development Commissioner’s office Mr. Vijayakumar, Specified officer hoisted the national flag. Republic day was celebrated in a befitting manner at the HR Academy and by all the schools in Sri City villages. As a part of the Republic day celebration, the Swachh Bharat run event was organised, under the joint aegis of IIIT-Sri City (IIIT-S), Institute for Financial Management and Research (IFMR) and Sri City Foundation, drawing participants from a cross section of the public in around Sri City. Soaking the ‘business city’ in their bubbling energy and enthusiasm, over 900 people hit the roads of Sri City for taking part in the ‘run’. At the dawn, the Raavi Circle on the express way, in front of IFMR, where the 10K & 5K runs began, saw a riot of colour. The participants were categorised into three groups, based on the age. Following the hoisting of the national flag, Prof. P.K. Biswas, Director, IFMR flagged off the 10K & 5K runs. Expressing satisfaction over the response to the event, Prof. Biswas urged all the stakeholders to maintain Sri City clean and green. Senior executives of Sri City units and several others with their presence added gloss to the event. 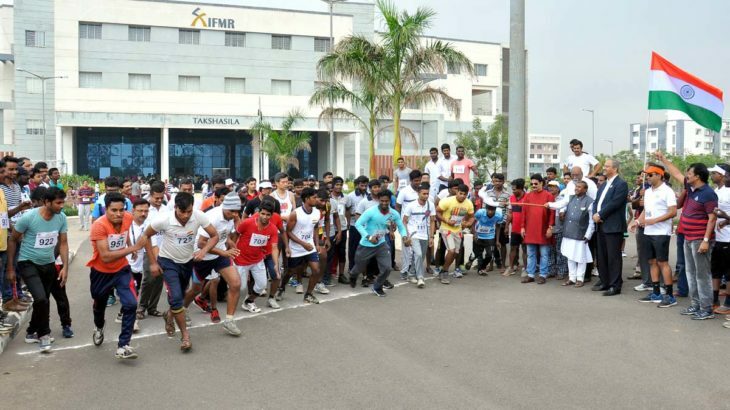 The objective for organising the run was to promote the concept of Swachh Bharat in Sri City across diverse Industries, Institutes and surrounding villages. All the participant were given T-Shirts. Prizes were presented to the winners in each group, and certificates were given to all who completed the run.